The Liquitex Basics Set of 48 is a shining star in the sky of acrylic paint - reliable, high quality colour that is fantastically affordable. Perfect for beginners, students and artists that want to use acrylic quickly, we think it's high time the Liquitex Basics Set of 48 got a How To feature of its own. Not only are they easy to use, but they make painting a pleasure, and come from the word's best-selling brand in acrylic colour. Liquitex was the first acrylic paint ever to be made commercially available (in 1955, no less) - so hats off to them for making paint accessible for all. We salute you, Liquitex. If colour is your thing, then this set is the perfect choice. The 48 colours cover the whole colour spectrum, which means you can save time on mixing, having every colour you'd need already to hand. 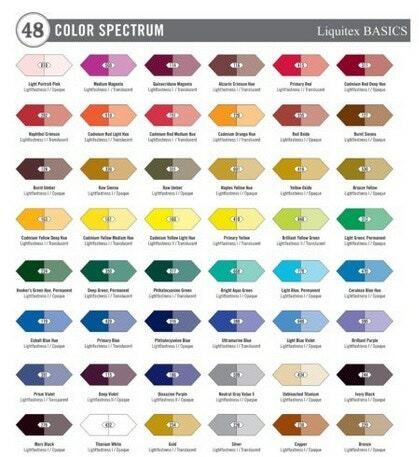 This also makes it the ideal set for painters wanting to experiment with lots of colours - the 48 colours bring you variety, vibrancy and efficiency, as you can paint quickly with several hues. The Liquitex Basics are loaded with permanent artist pigment, so the colours are lightfast and vivid. They're mixed with great care to give you a buttery consistency that's easy to manoeuvre and blend with other colours. Water-resistant and permanent, you can mix them with the Liquitex Professional Acrylics too, and use them with any gels and mediums the same you would with other acrylic paint. Squeeze a good amount of paint onto your surface for a heavy, bright texture, or add more water for a translucent effect. You can reach a diverse number of effects with an excellent range of colours - so why not experiment for a while before diving into the finished painting? Liquitex are renowned for their colour-matching skills. All of their products - thier paints, sprays, markers and inks - use the same pigments, so you can experiment with all their materials and create perfectly matched mixed media pieces. 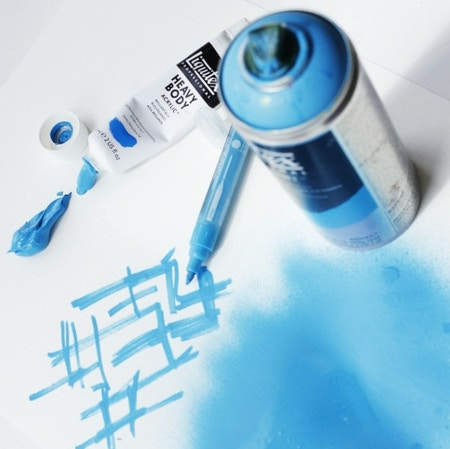 Give their Paint Markers a go, or achieve a different effect with their Artist Acrylic Spray Paint - using their other products in conjunction with these acrylics can produce exciting and unconventional finishes. In a colourful nutshell, the Liquitex Basics Set of 48 is a set of acrylics that offers brilliant colour and performance at an affordable price. It's the ideal choice for beginner's wanting to try acrylic painting for the first time, or for a painter who wants the luxury of painting quickly or a huge range of colours. It's an extensive and thoughtful gift for any artist at this time of year - with a brilliant range of additional accessories available! Check out the Liquitex Basics Set of 48 here - and make an artist's Christmas this year! Shop our range of other Liquitex products here - perfectly colour-matched so that they're brilliantly compatible with each other. Looking for something of artist quality? The Liquitex Heavybody Set of 12 is exclusive to Cass Art, and offers a heavier consistency, perfect for thick impasto brushstrokes.